We are proud to introduce our newest barbed wire line by StaTite50. 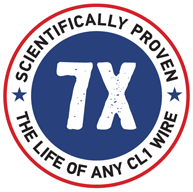 Much like our 50-Year Fence fixed knot fence, this barbed wire is the first and only of its kind available on the market today. Its unique Class 40 coating lasts 7x longer than standard barbed wire. Its reverse twist design won’t sag, is easy to install, and is maintenance-free. No other barbed wire on the market is as strong or lasts as long as StaTite50.